I came upon the following article, published in Investing Strategy on 30 July 2009 and was amazed by how relevant each point is for us today, even in our high-tech driven society. Have a read and see what you think? I think you'll find it interesting! "What can these ancient laws teach us about investing today? "A bag heavy with gold or a clay tablet carved with words of wisdom; if thou hadst thy choice, which wouldst thou choose?" According to George S. Clason, author of 1926's seminal money book The Richest Man in Babylon, 29 out of 29 Babylonians would choose gold. Personal recommendation is always the best endorsement and, wow, must say I am absolutely sold on the benefits of GoToMyPc! The beauty of this facility is that, not only can I access my PC (which is the nerve centre of my business) from anywhere in the world, I can now invite guests on to my site. How cool is that? Today, I had some technical issues and I was able to invite an engineer to access my PC remotely and my difficulty was resolved within minutes. No call out fees, no inconvenience. Terrific - that's my kind of solution! GoToMyPc is installed in minutes using easy-to-follow prompts and there's a free 30-day trial, so you've nothing to lose! Have a go yourself and see what an excellent resource this is. Individuals or small business are equally well served, just sign up in the relevant box. Go on, I dare you! Managing your business and emails from your chosen holiday location just became a reality . . .
With the property boom now behind us, did you know that the UK property market is now ideal cash flow investing? The only problem until now was that there has been hardly any practical guide on how to apply these techniques in the UK. 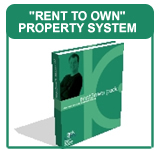 International Real Estate Strategist Rick Otton has just released an amazing step-by-step system on Rent To Own using lease options. Jam-packed full of working examples and practical scripts, forms, tips and guidelines the Rent2Own Pack is the first of its kind ever released in the UK! Everything you need to get started on your first lease option property investment using a Buy to Let mortgage is explained simply and easily! For more information, visit Rick's Rent To Own site now. Posting about business and personal development books. The veil has lifted from the communal eye and, finally, outsourcing is 'in'! And, know what? We each deserve to spend our time doing the tasks at which we excel and, most importantly, ENJOY! As the New Moons come and go, time seems to speed by more quickly. (Remember how, as a child, it seemed like ten years between birthdays or Christmas celebrations?) Heavens, we're into February already! 'Make Time For Success!' is a 142-page ebook/course that "cuts right to the chase of what it takes to transform yourself into a truly effective business person who knows how to make time, energy, and others work for him or her." The content is unique because it includes 6 very special techniques that highly successful people use to get more done in less time. I’ve yet to see these techniques presented elsewhere in such a concise way. And if you’ve ever wondered what your next 10 years will hold for you - maybe wished you had a realistic, 'do-able' plan - then 'Make Time For Success!' may well be your ticket to the successful future you want. Are You 'on target' or 'all cluttered up'? SUCCESS: "1. a favourable outcome to an undertaking 2. the attainment of wealth or fame 3. somebody or something that succeeds." Strive for it, run from it, embrace it, fear it... let's be honest, success is something we all want! But is it something we actively plan for, or is it a 'someday' sort of thing? Remember those dark, January days when New Year resolutions were uttered with total commitment? All those tasks that would be achieved this year; growing 'the business', sorting the paperwork clutter, establishing systems so the whole operation would move forward towards your ultimate success like a purring Ferrari. Has it happened yet, even a teeny weeny little bit of the plan? Did you take the ACTION necessary to bring your thoughts into reality?